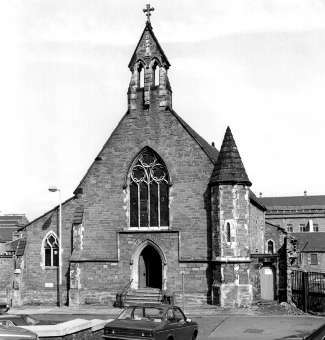 St Mary Magdalene's was opened for public worship on 23rd July 1854. It was the first new Episcopal Church built in Dundee since 1690. It was the first of many churches built by Alexander Penrose Forbes, Bishop of Brechin (1847–1875). It was built on waste land, known as the "Witches' Knowe", between the West Port and the Scourieburn. When Bishop Forbes first came to Dundee, the Episcopalians met in a large upper room in Castle Street (the windows are still visible). The Chapel could seat 300 people and all the pews were "rented". There was not much room for newcomers. The Bishop's arrival coincided with the Irish potato famine, which led to many thousands of Irish people moving to Scotland to obtain food and jobs. Many of them went to Glasgow but a large number came to Dundee, attracted by the jute factories which required cheap labour. The city of Dundee grew from 20,000 in 1840 to almost 140,000 in 1875.